Every time I hear the words “the gift that keeps on giving” my mind immediately steers down Christmas Vacation lane towards cousin Eddy in his iconic dicky and the ultimate gift Clark receives: the jelly of the month club. Such a good movie. I may just have Sparky’s rant memorized from binge-watching it in the early years of marriage, but that is neither here nor there. While I personally would love a monthly club subscription, for say wine or cheese perhaps (pst…mom!) there are other gifts that continue to give and give, especially the handmade ones, making the holidays extra special for someone you love or care about. I the spirit of keeping things simple but still homemade, the kids and I have decided to gift their teachers, helpers, and some of my dear friends planted paperwhites! I love this gift for several reasons: they are easy to grow, requite little maintenance, and bring natural beauty into the home during a rather colorless and bleak time of year after the holidays have come to an end. January and February can be a little blah around here visually speaking, and this gift continues to give beauty and connection to the earth despite it. With a little care, some water, pebbles, and sunlight, paperwhites bring cheer to the home and nudge along the promise of spring. Here in the Midwest, our seasons are consistently unpredictable. While we always have all four, never know what kind of season we’ll get. For example, some winters are mild and give us little to no snow, while others are long and dreadfully icy. This simple gift is perfect because no matter the length or severity of this winter season, those gifted a planted paperwhite will have something to grow – a reminder that soft spring grass and new buds aren’t that too far off. Hope and joy in bulb form! 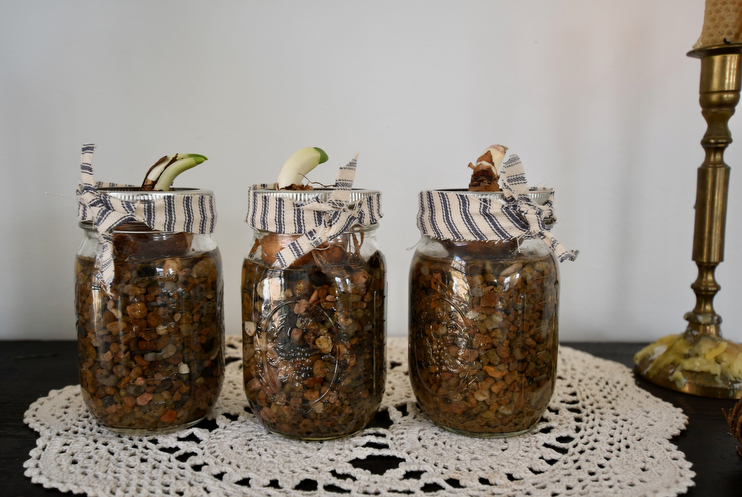 I asked Stella what she thought we should gift the bulbs in, and immediately she came up with the idea of planting them in clear jam jars so we can watch the roots grow. We’ve got plenty of those on hand, so no buying required. And then we used scrap fabric to make little ticking bows to cover up the tin rim. I think they turned out so well! Here’s how you make them. Paperwhite bulbs from your local nursery – they are in season! To plant the paperwhites, fill each jar with small rocks or pebbles, saving room about 1-2 inches from the top. Place each bulb (roots facing downward) on top of the pebbles so the shoot is exposed. Fill jar with water until you see it reaching just below the base of the bulb, but no higher! If the bulb sits in water, it will rot. 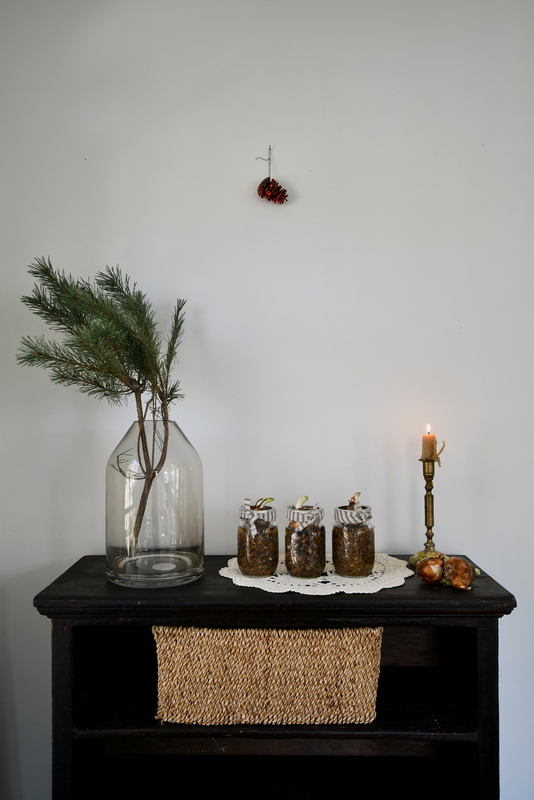 Add festive bows, fabric, or greenery around the jar, and write out the care instructions to send along with each plant. That’s it, really. Simple and sweet. Below are care instructions you can write out and send along with each tea cup. Keep tea cup out of direct sunlight in a cool place to root. Check frequently and keep watered only when the stones are dry. 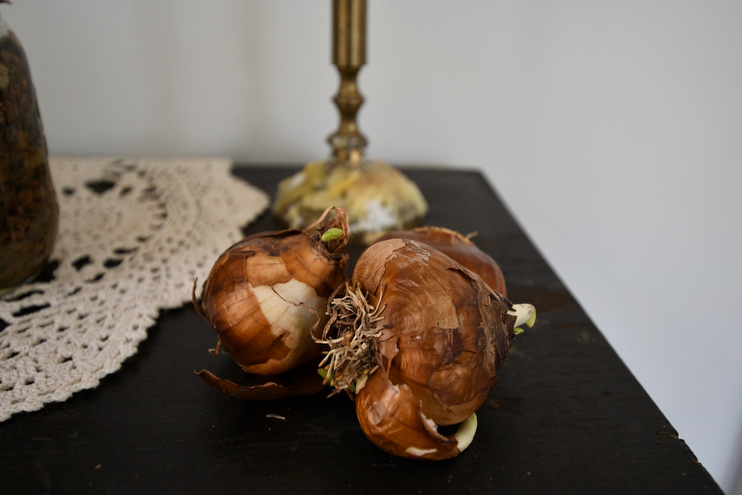 Once a week, gently tug on bulbs to see if rooted. Once rooted, move to a sunny window and continue to water several times a week.